This report was written for the International of Anarchist Federations in March 2007. A Spanish language version is here. There are, at a very conservative estimate, currently thirty local campaigns against unwanted hazardous developments in Ireland. Most notable are campaigns against incinerators in Ringsend, Dublin, and Ringaskiddy, Cork, a campaign in Bantry in rural county Cork against pylons, which appears to have been successful, and the opposition in Erris, County Mayo, to a gas pipeline and refinery being built by Shell. These fights have employed different methods and differing forms of organisation. Institutional means include appealing to ‘An Bord Plenala’, which is the planning board to which one can appeal the decisions of the local government, or legal challenges in the courts. Protests and direct action are perhaps less common, but not uncommon. There is little in the way of an environmental NGO sector in Ireland, and what exists has little connection with local campaigns around planning and development. There is a Green party, but it only shows a major interest in these campaigns when they are in areas where it has a parliamentary presence, it also has little in the way of an activist base. Erris is a very remote, rural, and marginal part of Ireland’s western Atlantic seaboard, characterised by small holdings on poor land, small scale fishing, and high outward rates of migration. Socially similar to Achill island to its south, which used to be known as the wintering quarters of the farm labourers of England, the economic role of Erris has changed since then only in so far as its migrants would now be found in other occupations. Part of Erris is Gaelic speaking, this is a minority language. Although the nationalist ideology of the Irish state ostensibly sought to spread this language throughout its territory as an alternative to English, in the 60s residents of Irish speaking areas had to organise themselves into a civil rights movement. Unlike much of the West of Ireland the tourism industry is not a major feature in Erris. The economically marginal nature of the place must have been central to it being chosen to be the home of a refinery complex. Indeed Shell’s gas refinery is not the only low employment and high pollution development which has been planned for the area. Since 2000 there has been an ongoing attempt to build a 9 kilometre long high pressure gas pipeline in Erris, through the village of Rossport, to a planned gas refinery in a place called Ballinaboy. This is to exploit the Corrib gas field, which is 80 kilometres out into the North Atlantic, and which was discovered in 1996. The state’s ultimate plan, which they have openly published, is to see all the gas off the west coast of Ireland, exploited through the construction of additional refineries in Erris. Many resisting residents and other campaigners believe infrastructure for the exploitation of oil will also be developed there. Originally the Corrib development was in the hands of Enterprise Energy, later this company was bought by Shell, and the development is now being carried out by a group headed by Shell, and also including Statoil and Marathon. From the start the gas refinery project has been assisted by the local establishment, the Chamber of Commerce, clergy, and political figures from the two main right-wing parties, which are predominant in Erris. The opposition, principally organised into the campaign group Shell to Sea, seeks, as the name suggests, that Shell’s cost cutting plans for an on-shore refinery are shelved in favour of a slightly more expensive off-shore refinery. An off-shore refinery is the industry standard, and the model that Shell are employing here is a new, cheaper, innovation. This is a minimum demand, a demand for what it is possible to get, but the resistance has deepened and there is a far wider critique of ‘the way things are’. The campaign principally focuses on the potential for detrimental impacts on the health and safety of the local community should the project go ahead in the form it is currently envisaged. The refinery part of the project was delayed in the planning process for several years until final approval in late 2004, while the pipeline was made exempt from the normal planning process. Work began in the spring of 2005, and was brought to a halt with a variety of direct action from June 2005 until October 2006. Five residents were imprisoned over the summer and autumn of 2005 for refusing engineers access to their farmlands, and those of their neighbours, in defiance of a court order. The farmlands were subject to a ’compulsory acquisition order’ and were to be part of the pipeline route. They became known as the ‘Rossport Five’ and became popular symbols of the struggle, eventually being released, after ninety four days of indefinite imprisonment. After the jailings mass picketing, involving hundreds of people in what is an area with a very low population, shut down construction work on three different sites; Glengad, where the pipeline is to come onshore, Rossport, where most of the pipeline is to be, and Ballinaboy, the refinery site. In August fishermen announced a plan to blockade with their boats construction of the off-shore section of the pipeline, with the result that this part of the construction work was also cancelled. In June of 2005 Rossport Solidarity Camp was established, this is a protest camp on the pipeline route where people can stay if they are travelling to the area to join in the fight. After all this the state made efforts to dampen the resistance by conceding a little here and there, while going ahead with the project. The prisoners were released, a government mediator was appointed, who produced a pro-Shell report, and as yet unclear modifications to the pipeline route were proposed. This process went on for much of 2006. As part of this it was announced that towns in Mayo, the county in which Erris is, are to be hooked up to the national gas grid. Previously the gas was just to flow straight out of the West. In September 2006 Shell announced their intention to resume work at the refinery site. Numbers of people at the picket, which had gone on each working day since July 2005, increased massively to meet this threat. On the 3rd of October 150 police were drafted in from all over the country to re-open the Ballinaboy site for Shell. Normally there are 20 police stationed in the entire area of Erris. The site was re-opened, and part of their strategy now has been to employ local building contractors to promote division, and so the media and state can portray the situation as a ‘civil war’. Along with the police presence has came increasingly hostile media attacks, often using local political and business people. The police have operated a no arrest policy, so as not to create ‘martyrs’, and that has been publicly stated by the officer in charge. Instead of arrest they are using assault. Since October attempts to blockade the refinery site have been foiled by police aggression. Nonetheless protests are continuing each morning of each working day on the ‘material haulage route’, which construction traffic travels on to get to the site. 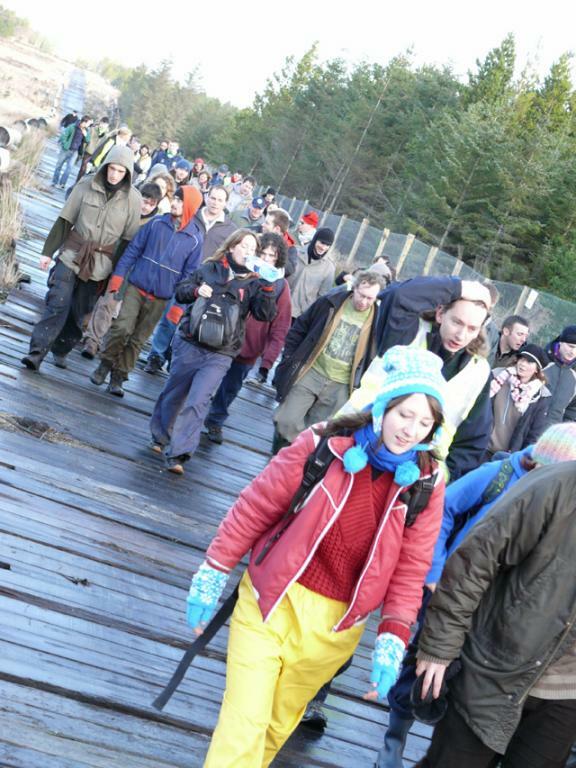 On the 16th of February 2007 work was shut for a couple of hours by a 100 strong occupation of the site. "We have huge amounts of people … that are affected with Shell's dumping of tons and tons of toxic chemicals into the air. This has resulted in ... asthma, as well as leukaemia and cancer, which is prevalent, very rife and high … in my neighbourhood fifty two percent [52%] of the educated and learned at a local primary school have got asthma, and the leukaemia rate is twenty four  times the norm than anywhere else in South Africa.” - Des D'Sa, South Durban Community Environmental Alliance, South Africa. In addition to the proposed refinery’s air emissions the site adjoins Carrowmore Lake, the source of the regional public drinking water supply, which has already been polluted by aluminium run off caused by construction work. Waste from the refinery is to be dumped into Broadhaven bay, home to seals, dolphins and whales, and which is a source of livelihood to local people through fishing. The refinery will be a contributor to climate chaos, pumping out annually the same amount of carbon dioxide as 10,000 cars, with methane emissions on top of that. Another issue the campaign has highlighted has been the extreme neo-liberal conditions for oil and gas exploration and production in Ireland. For this the Irish state has a low tax rate, apparently effectively the lowest in the world, whereby companies can write off all their production costs against tax, conceivably paying no tax. As well as Statoil and Shell’s interests, Exxon-Mobil have an 80% share in one oil field and one gas field off the west coast. Several Irish companies are involved, including one owned by international media baron Tony O’Reilly. The Libertarian Left; anarchists, radical environmentalists, the ‘horizontal’ wing of the anti-globalisation movement, have been heavily involved in this struggle. This involvement was pivotal to the establishment of Shell to Sea groups around the country, to Rossport Solidarity Camp, and to solidarity actions in Britain. This is probably the most significant popular struggle in Ireland to have this extent of libertarian left involvement since the movement against uranium mining and nuclear power in the late 70s and early 80s. The Shell to Sea campaign has made considerable international links. On November the 10th 2006 there was a protest at a Shell refinery in Durban, South Africa, simultaneous with a ‘day of action’ in Erris which saw an attempted blockade of the construction site met by police violence. The date marks the anniversary of the execution of ten of Shell opponents, most famously Ken Saro Wiwa, in Nigeria. People from Durban have visited Erris, and people from Erris have visited Durban. Relatives of Saro Wiwa have visited Ireland to speak at Shell to Sea rallies and public meetings, and in Erris the connection with Nigeria is marked with murals, protest signs, and a row of white crosses commemorating the executed. Other visitors have included people from struggles around resource extraction in Appalachia, Iceland, Ecuador and Bolivia. Actions in solidarity with the struggle against Shell in Ireland have taken place in other countries, principally England and Scotland, but also in the United States, Spain, Holland, Germany, Norway, Sweden, and Australia. Although Shell have regained control of the Ballinaboy refinery site over the winter of 2006/2007, for climatic and geological reasons, or rain and peat bog to put it plainly, work is actually less advanced now than when it was brought to a halt in 2005. All that is happening at the moment is preparatory work to get the site ready for construction proper. Media and police attacks have impacted on the campaign, and tempered its militancy. Bear in mind that this is all happening in an area with next to no tradition of popular struggle. Nonetheless protesters have been continuing to gather each morning of each workday, and the brief stopping of work due to the occupation on the 16th of February beckons to a possible return to the direct action tactics which have served the struggle so well so far. Construction of the refinery itself, due to begin in mid-summer 2007, will have to last for two years, and Shell are ostensibly seeking a new route for the pipeline, something which may open a new front for the resistance. The state has a line of retreat as there are ways in which the project can be halted through the ‘legitimate institutions’, both regulatory mechanisms and in the parliament, there being elections scheduled for the middle of this year. In any case should the effort to put Shell to Sea be defeated, it is by no means necessarily the end of the story, as most struggles of ’fenceline communities’, living next door to the oil industry, are for the cleaning up of, or minimising of the effects of, actually existing industrial plant. Also it appears that this current refinery project is intended to be to the first of a series. While the environmental issue has limited potential to captivate the attention of most working people elsewhere in Ireland and spread the struggle, a strong asset to the campaign is the potential for widespread popular outrage at acts of repression to force a hazardous development through. Also the neo-liberal nature of resource extraction links up what is happening in Erris to discontent around the country over the under funding of health and education services. Solidarity protests elsewhere have an extremely positive impact on the morale of people in the frontline of fighting Shell, Statoil and the Irish state. Suitable targets are of course anything connected to those companies, as well as Irish embassies or consulates. More volunteers are always welcome at Rossport Solidarity Camp.